A record-setting heat wave in the Chicago area is expected to continue for at least one more day. The Chicago Tribune reports that the National Weather Service expects temperatures to climb as high as 92 on Monday. If that happens it will mean the string of 90-degree days that started last Wednesday will extend to a sixth consecutive day. When temperatures climbed to 92 on Sunday, it broke the record for that date of 91 set in 1891. And it marked the latest in the year that Chicago - according to weather service records - has ever seen five straight 90-degree days. With temperatures expected to hit 90 degrees again in the Cleveland-area, many local schools are giving students and staff the day off due to the extreme heat. The Cleveland-area has been enduring a fall heat wave for the last few days, with many high-temperature records falling by the wayside. On Friday, September 22, the high of 92 degrees in Cleveland set a new record. Meanwhile, at Waukegan High School's Brookside Campus, Illinois, fall officially started Friday but it's now day four of record-setting 90-degree temperatures in September. On Friday more than a dozen ambulances were called to homecoming festivities at a high school in Berwyn for a similar situation-students started fainting from heat exhaustion. 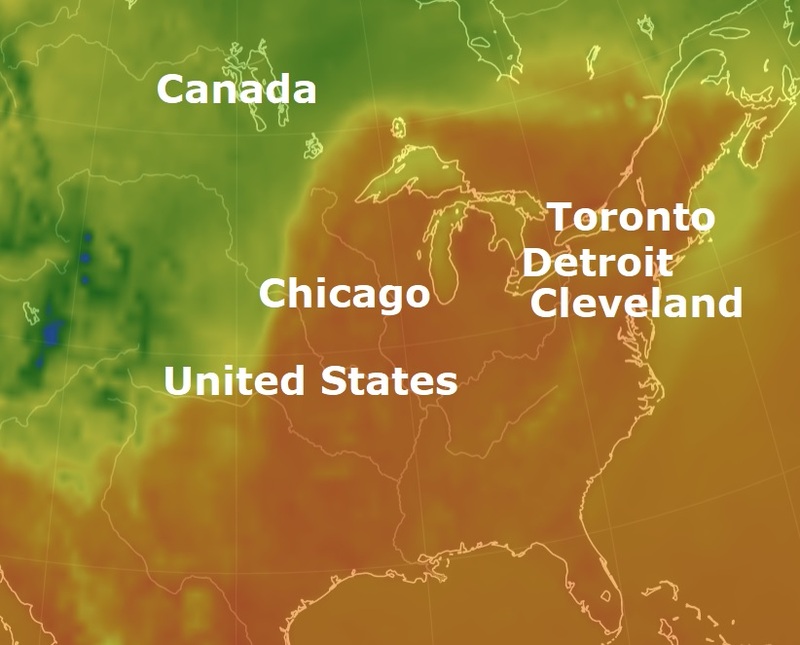 By 3 p.m. Saturday, temperatures in Metro Detroit reached 90 degrees, breaking a record set in 1936 by one degree, said Jordan Dale, a meteorologist at the National Weather Service in White Lake Township. "We expected it to reach up to 90 degrees, but it should be topped out and we have a chance again tomorrow to break another record," Sara Pampreen, another meteorologist at the National Weather Service, said Friday there have only been four days during the summer in Metro Detroit that hit 90 degrees or warmer. "We have three in June and one in July, but that's it," Pampreen said. "It is above normal and a little unusual to see." Detroit has seen 90 degree days in September before, but usual temperatures in mid-September reach a high of low 70s. And across the border in Canada Waterloo region and Wellington County is looking at another "record-breaking day" with unusually high temperatures for late September. "I think this may be the longest period of nice weather at the end of September," said Bruno Marquis, who's a meteorologist at Environment Canada. The heat warning issued on Friday is still in effect. Sunday has a high of 32 C, feels like 40, and Monday is a high of 31 C, and feels like 40.